I chose to finish, Text Detective, that I started last fall. My students were good at putting capitals and periods in single sentences, but I continually found need to reinforce using them in a series of sentences. So, I made 4 pages of practice, and I was delighted with the improvement I observed. Now, most were doing a great job paying attention to where sentences start and stop. 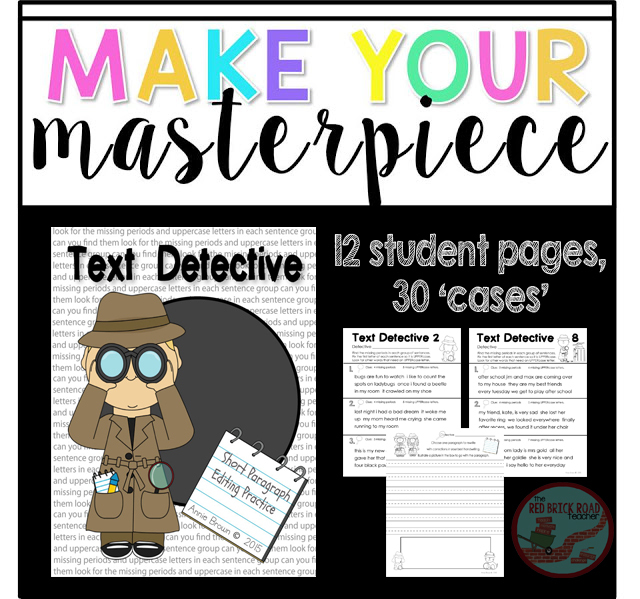 This summer, Text Detectives was on my list of projects to finish. It's was dragging, so this was the kick I needed! I am pleased with the final outcome - 10 pages plus two writing pages. I look forward to giving my first graders more practice with this skill. I know they will like the detective - look for clues - approach. Makes it fun while learning! As an extra bonus, we were required to find a partner to swap with for review, editing, and input. I was fortunate to share this with Emily from Third in Hollywood. It was great to hear her thoughts and suggestions. I enjoyed reviewing her product, Fraction Action, too. Teachers love to help and support each other! Great job! I really enjoyed working with you, and am very excited to use this product of your in the fall with my students! It's an awesome product! Emily, you are so sweet. Supporting each other on projects is such a great feeling. Loved our sharing! I know I will do it again. You may get this twice!